Character education matters, perhaps now more than ever. Fortunately, many schools are answering this mandate with programs aimed at cultivating individual integrity. Still, the job of character education should not only be about cultivating the individual. Along with equipping young people with a robust ‘I’ mindset, character education should strive to nurture a high functioning ‘We’ mindset. Learning the tenets of collaboration and group integrity builds character strengths and skills essential in today’s intensely connected world; a world that demands an able and agile ‘We’ mindset. In my book, Growing the We: Collaboration and Character Education, I outlined ten collaboration-related character strengths and activities that promote their exploration and understanding. The book comes with an illustrated poster that uses kid-thropomorphized fish to showcase each of the 10 character strengths that are essential for and supported by collaboration. Each collaboration activity is explained according to Growing the We’s G R O U P framework. The framework reflects an experiential approach (i.e. do, then discuss). Check out the framework below and then try out the following activity for cultivating character strength #10, Be A Resource, in your classroom. Remember Character Strength #10 BE A RESOURCE: Make your teammates look good. Enliven, energize, engage and enable. Teams of two. Use tape or paper to delineate a large rectangle (e.g. 4’ x 12’). Objects of various size are placed randomly within the rectangle and will serve as obstacles. One child is the Pilot, the other is the Control Tower. The rectangle represents the landing strip. Because of poor visibility, the Tower must guide the Pilot to a safe landing through the large rectangle. To make a safe landing, the Pilot can’t touch or knock over any of the obstacles. The Pilot also can’t step outside the rectangle. The round is over when the Pilot has either encountered an obstacle or made it through the course. If space allows, several rectangles can be set up and used by multiple teams at the same time. What was it like to be the Tower? How did it feel? What was it like to be the Pilot? How did you feel toward your teammate? How did that feeling change during the activity? How does this relate to our classroom community? What might it mean to/ for us? Probe perceived connections to other situations. How can we use what we experienced today to enhance our classroom community? How else? What collaboration-related character strengths feel involved? How? What, if any, seems less central? Why? In what other ways can we practice these strengths? In what ways do they help grow our ‘We’? 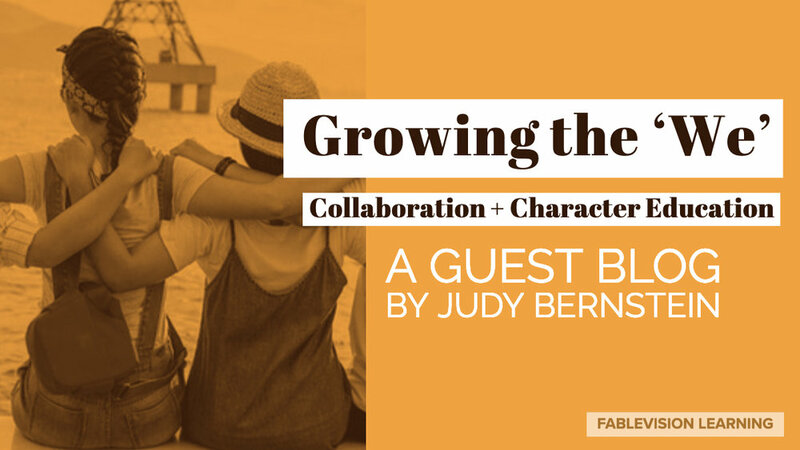 An accomplished innovation trainer/ facilitator, Judy has expertise in Creative Problem Solving, FourSight thinking systems, human-centered design, group creativity, and LEGO Serious Play. She holds a Master of Science in creativity, teaches human-centered design for the LUMA Institute and Creative Problem Solving to US special forces, and is an instructor at the Creative Problem Solving Institute. She is the author of Growing the We: Collaboration & Character Education.